Not everyone has space in their lives to sit down and read a blog so, as part of the move to the new site, p cubed is now offering podcasts. This is a new step so help me out with ideas and suggestions, give me feedback on what you’d like to hear and join in the discussion. 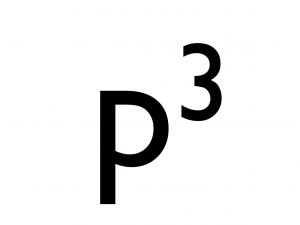 The first podcast should clearly be on the p cubed concept. What is it and how does it affect our presentations? Every presentation, whether it is an audit project, your research thesis, clinical teaching or a business case is made up of three parts: the presentation (the story), the presentation (the slideset) and the presentation (the delivery). The construction of the presentation is therefore key to its impact and success. Powerpoint, or equivalent slideware presentations are ubiquitous. There is an almost universal conformity in the nature of the slidesets generated, based upon the concept that this represents the most effective means of transfer of information. Many presentations are constructed almost totally on the slideware platform. Text is entered directly to build the slide set and from this the story is constructed. The delivery of the piece is therefore constrained by this initial construct and its impact is the sum of these parts. A presentation built on a carefully crafted story, designed for the individual audience, supported by an illustrative slideset and delivered with passion and practice will be more, much more than the presentation built around bulletpoints; its impact is the product, not the sum of its parts. This blog aims to discuss and build upon this p cubed concept, offering opportunities for discussion and learning around the nature, construction and delivery of presentations to maximise the impact and success of presentations. So, that’s it, podcast #1. Let’s give great presentations. Thank you for all of the thought and work that you put into what you share with the world. Thanks Tim. If we can can improve presentations, imagine how things would improve? New to the p cubed concept. Absolutely awesome. Trying it out for my next presentation. Keep up the great work!